I love when an old friend surprises me. As a former New Englander, I’ve enjoyed Yankee Magazine for years, finding it a great source for traditional recipes that use seasonal ingredients. Yankee isn't the first place I’d think to look for a nutty, nontraditional, vegan salad, and yet their Fruits of Fall magazine supplement, published in 2000, contains just such a recipe. 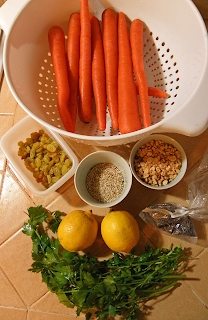 While carrots are harvested year-round, this is a wonderful late fall/early winter recipe because it combines carrots with lemons, which are just coming into season. It’s unique flavor is perfect for jaded post-holiday palates. Peanuts and two kinds of toasted seeds (and oil flavored with same) add an unusual nutty taste to the sweet carrots and raisins. The carrots, nuts, and seeds provide health benefits as well as a lot of crunch. I made just a couple of changes to the recipe. I reduced the salt from ¾ tbsp. to ½ tsp. You can use any amount in between. Also reduced the oil from 3 tbsp. to 2 tbsp, and added 1tbsp. of water to the lemon juice to compensate. I also served the peanuts on the side as a topping so that leftovers would be just as crunchy as the first day. Note that my mustard seeds didn’t pop for whatever reason, instead they kinda bubbled. Don’t overcook these seeds. 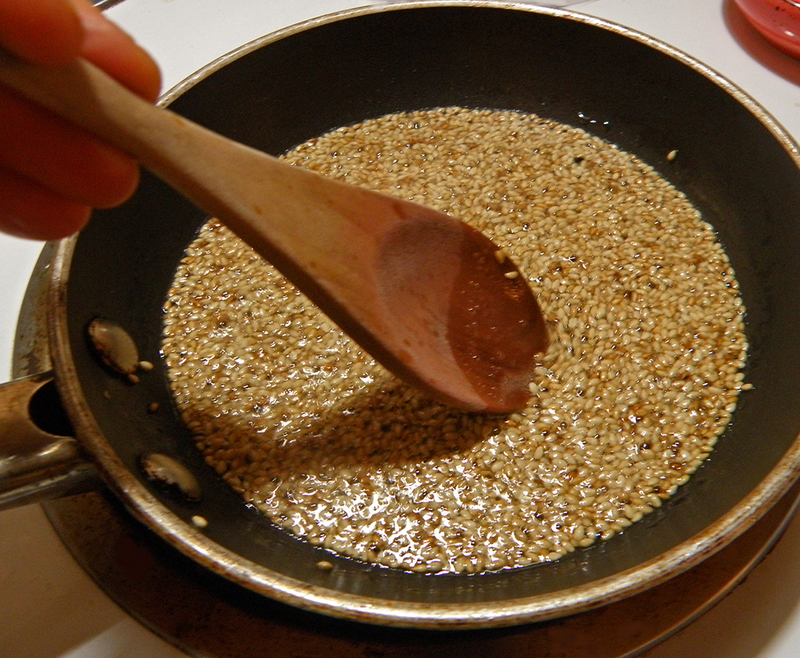 Saute the mustard seeds no more than 30 seconds, then dump in sesame seeds and cook till they’re golden and/or pop. Note also that raisins must soak for one hour. I soaked mine the day before (just for one hour, per recipe), then drained and refrigerated them until I made the salad the next day. Bright orange carrots and green parsley make this a cheery dish, perfect for gray winter days. 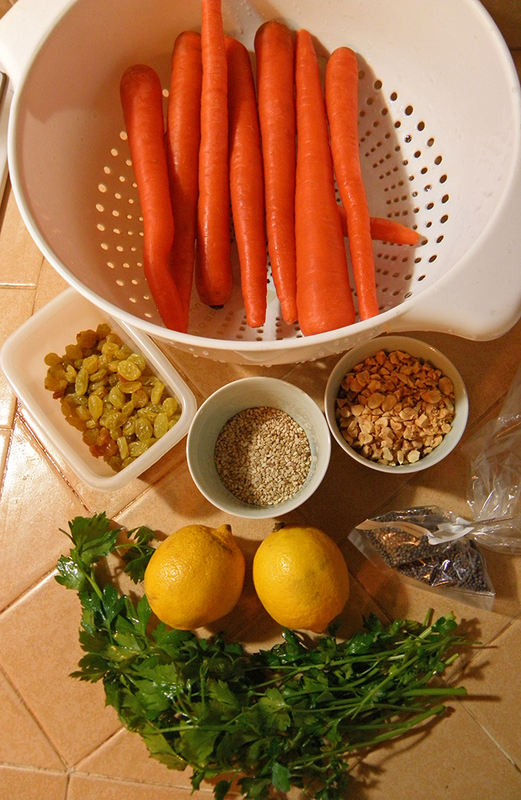 You can make it even brighter by using a lemon zester to add big yellow lemon strips to the carrots and parsley. This would also be a fun winter potluck dish. Place raisins in small bowl, cover with hot water, and let stand for 1 hour, then drain. Coarsely chop the peanuts. Grate lemon peel and juice lemon. Add water to lemon juice. 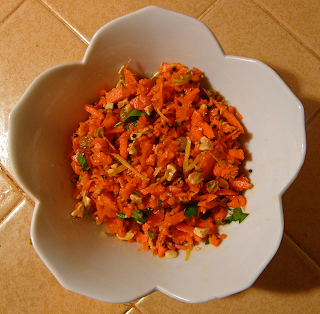 Peel carrots and grate coarsely into a bowl. Add drained raisins, parsley, and salt, mix together. Heat oil in small frying pan. When hot (shimmering), add mustard seeds, and in a few seconds they will begin to pop. As soon as they pop, add sesame seeds, and cook until these pop or turn golden brown. Toss oil and seeds over carrots. Add lemon juice (with added water), lemon peel, and pepper. Toss together. 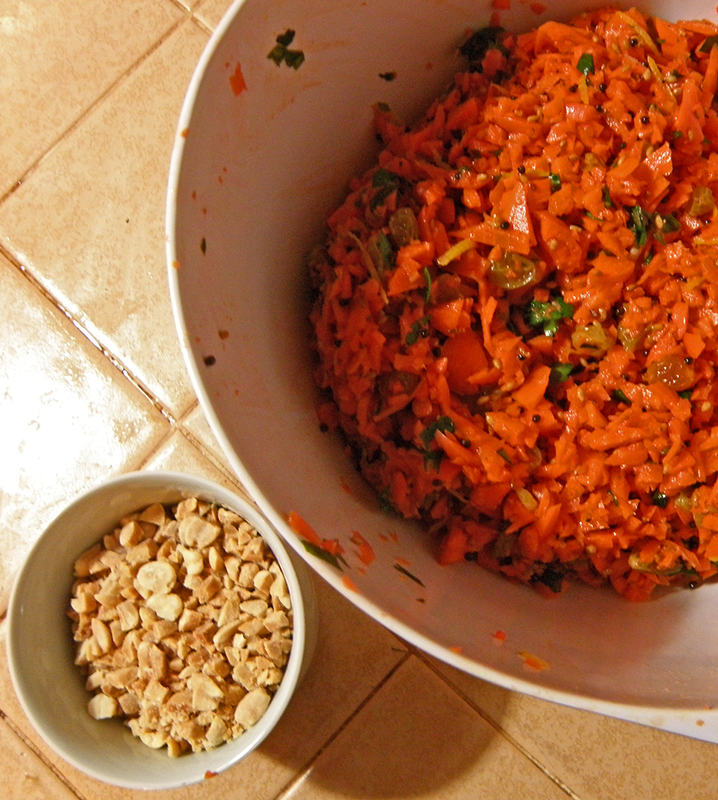 Immediately before serving, top with peanuts.